Burger King has unveiled its A.1. Halloween Whopper. The seasonal burger was inspired by the black burger that was a hit in Japan. That burger was called the Kuro burger. 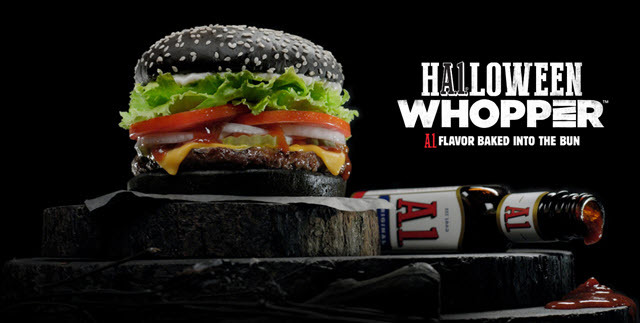 The Halloween Whopper has a black bun and A.1. smoky black pepper sauce. The burger also contains grilled beef, American cheese, tomatoes, lettuce, mayonnaise, pickles and sliced white onions. The Kuro burger in Japan featured a sauce made from squid ink which may not have gone over as well in the U.S. Launching a menu item specifically for Halloween is a fun idea. We think there should be more promotions like this. The scary burger will cost $4.99. McDonald's competed with Burger King Japan on the Kuru burger with two Halloween menu items and an ad featuring a witch and ghost. They also had a Halloween dessert. We will see if McDonald's USA comes up with any interesting Halloween menu items for Halloween 2015.